Automatisierung von Shared Services oder "Take the robot out of human"
Never gets sick, never makes a mistake, doesn’t mind how stupid the tasks: Don’t we secretly all want someone like this in our team? At Henkel this is the IBotS Virtual Workforce. Sara Geising-Eggers, Global Head of Continuous Improvement Integrated Business Solutions bei Henkel, explains how automation of Shared Services can lead to something amazing: to take the robot out of humans. Sara, in 2017 Henkel introduced a virtual workforce. What are the features of a virtual workforce? I like this question. Features is already so technical, I see it more from an operational view: our IBotS Virtual Workforce colleagues work 24/7, never get sick, never make a mistake, don’t mind how stupid the tasks are and provide all data to make them more efficient. Your focus at Henkel lies on its Shared Services. What is the current Shared Services infrastructure at this multinational company? How many SSCs do you have? How many people are working in it? What are their tasks? We operate with 7 centers across all regions, functions and our 3 business units. From our 3,000 employees 85% are Gen Y, 60% female and our team consists out of 46 nationalities. We are organized in global processes and our service portfolio is beyond functional services such as Finance, Purchasing, HR. Around 50% of our colleagues in Shared Service work for business processes like Marketing, Sales and Supply Chain activities. The nature of the tasks can be transactional but as well we have highly skilled experts in Regulatory or Researches and some Center of Expertise, e.g. for Robotic Process Automation. One of your tasks is the improvement of Henkel’s Shared Services area. How has the work of Henkel’s SSC changed over the last couple of years? The focus of our SSCs was “Growth”, during the last years we shift to “Optimization”. In many cases we do not only operate the processes, we know them the best. We trigger improvements from tiny steps up to big process changes. Here technology is one of the key drivers. As part of the organization Integrated Business Solutions, together with IT, we provide technology and service. Under the umbrella of digitalization we are facilitating the understanding and utilization of technology. What role does AI play in this transformation? AI will be a game changer. Today we are operating in the barriers of the systems or applications, AI will allow us to look beyond. The technology will be our assistant in getting a better picture on situations, notifying, recommending, predicting and preventing. Driving this transformation is a huge empowerment and allows us to design the jobs of the future. In your #ada17 questionnaire you said you love Tech because it enables us to focus on the important things. If Shared Services are automated at Henkel, what can the people working in Shared Services focus on? I heard somewhere the sentence “Robotic process automation takes the robot out of human” and this is I think a great visualization. Our colleagues in the SSCs will in the future become even better business partners supporting to satisfy our customers, increase time-to-market, be more agile and drive innovation. Many new jobs are directly build up at our Shared Service Center, for example a couple of years ago the e-sourcing team for Henkel or now our Center of Expertise in Robotic Process Automation. Sara is giving a workshop at #ada17. Her topic: Artificial Intelligence = Intelligent Artificals? The end of human decision making and administrative work? How far can/should we go on this road? Join her and become part of Ada Lovelace Festival 2017. Sara studied International Business at Munich Business School and Interdisciplinary Center in Herzliya, Israel. 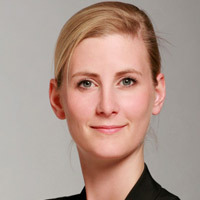 In 2010 she started in Henkel’s support team of the CFO focusing on the profile of controlling community, moved on to the Beauty Care division to take over the strategic initiative of process and service optimization and rotated to the biggest Shared Service Center in Bratislava, Slovakia, afterwards. Since 2015 Sara has been the global head of Continuous Improvement and Automation for the Shared Service area at Henkel.